I keep wanting to write up a blog post with more depth, but it just doesn't seem to happen. I think I remember the same thing last summer. 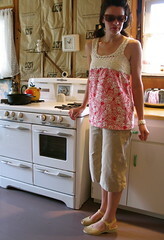 Anyhoo, today I finished this long-time (over a year) WIP — a skirt made from a flea market baby quilt. The photos were less than great, so I paid my $25 and signed up for picnik. I probably could have played around in Photoshop using the prescribed layer configuration for a Lomoish look, but sometimes it's just easier to use a Flash interface that helps you do the same thing, only easier. My first real life, non-elastic pants with side zipper, sewn by me. It all started with a vintage men's pajama pants pattern. After altering the pj pattern a couple times to make it more fitted, I realized I could add a couple darts to the back, and a zipper to the side, and call it pants. I ended up adding a waist band instead of facing because I trimmed it down too low. Finally, I have pants with a waist band that fits me. It doesn't cut into my no-waist-having self. I stay stitched the hem and let the fray stay. These pants were made for my San Francisco trip. 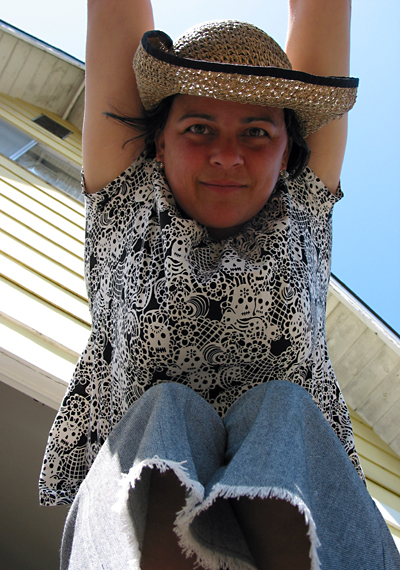 And, since I always feel like a country bumpkin when in the city, I thought I'd make it a theme — frayed hem and straw hat were worn with pride. Do you see a uniform emerging? A style? Yokel couture, perhaps? 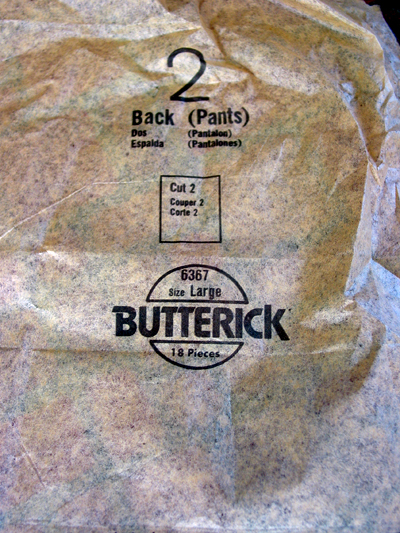 I made my first French seams on these bad-boy bumpkins. 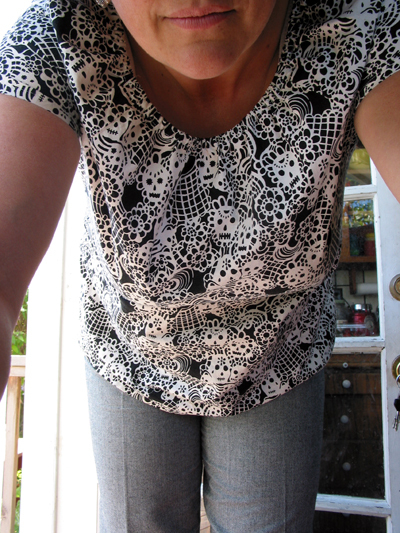 I'm feeling sassy with my made-by-me outfit. My first coat. My first lining. And, most importantly, my first buttonhole(s). 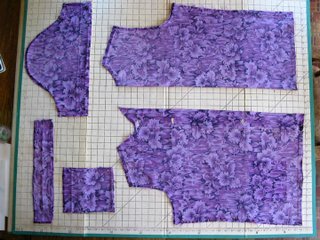 Now, is there an online tutorial for fussy cutting the front so it matches up? While cutting, I was thinking about how the sides match, but forgot about the front, doh! 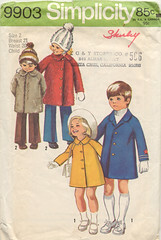 Vintage Simplicity 9903, a classic from my childhood. I think my grandma made the fuzzy version for my sister. 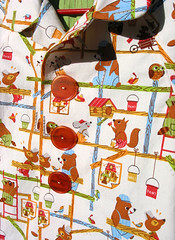 Wonderful Richard Scarry-esque construction crew canvas fabric, part of my first purchase from Superbuzzy. What a fun package that was — all so beautiful and different, lovely and Japanese. The lining is plain green quilting cotton stitched to look like woodgrain from a variety of brownish threads (read: lazy sewer doesn't want to match bobbin thread and doesn't seem to have two matching browns anyway). Tension was a little wonky, but i went with it anyway. In St. Blaize speak, it's a "better-than-it-was situation" — sometimes that's enough. 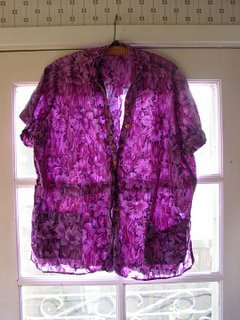 I left the sleeves plain, not wood-ified, because i thought it would feel funny, too bumpy. Lining installation went well even though my brain refuses to think inside out. 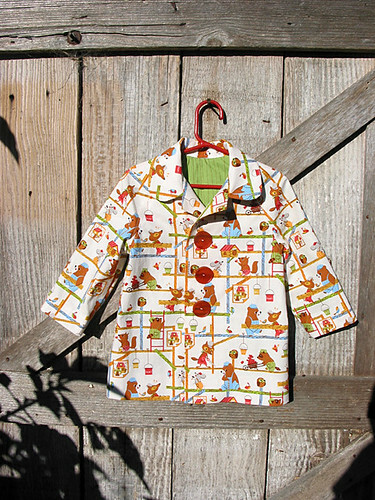 To Kristin at Sew, Mama, Sew, for the inspirational Kid's Clothing Month sew-a-long. I really pushed to get this done in time to post in the Flickr group. To my mom, for putting up with my kvetching about buttonholes. 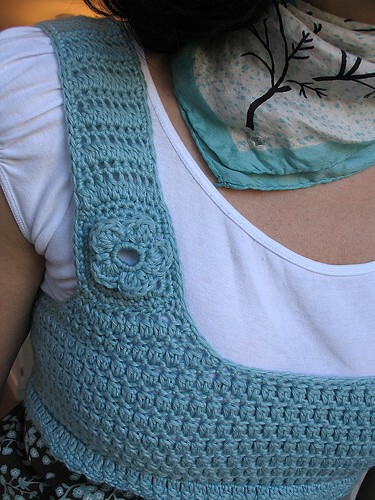 I like to talk, complain, dread, ask a ton of questions, and fret a lot before I finally dig in and try something I've never done before, like make buttonholes, or choose a kindergarten for my child. To Sara, for a wealth of knowledge about sewing and kindergarten. To my happy customer, for being socuteIcan'tstandit (one word). At my mother-in-law's request our family attended the Gatsby Picnic a couple weeks back. It was motivating, if nothing else. Where does a 185 lb, 5 ft. 9.5 in. 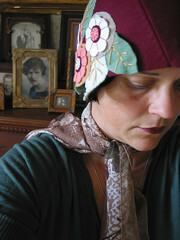 girl get herself some authentic 1920s or 30s vintage outfits in a hurry? She doesn't. She has to make them. 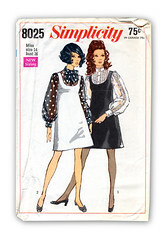 I started by buying some patterns from Decades of Style because they have redrafted some great vintage patterns to fit larger sizes (Angelina are you listening?). I made this skirt and this jacket (still a WIP). My sister found a vintage-looking Target sweater at a garage sale. I just happen to have some vintage size 11 shoes that worked. My goal was to look appropriate, but not too fancy. 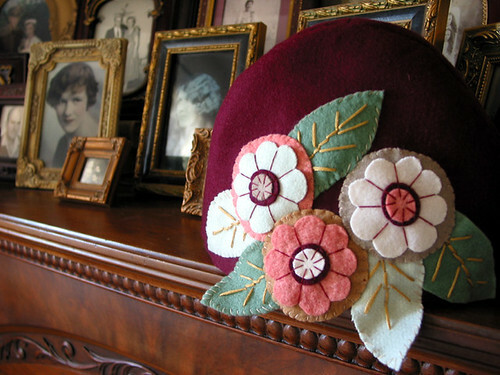 After looking at the Vintage Pattern Lending Library I was dying to make one of these wonderful felt hats. Of course, I picked the one with the flowers. I used all materials from the stash — a benefit of being a hoarder. 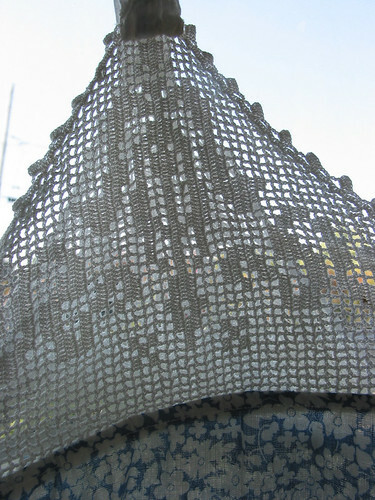 The picnic day turned out to be very warm, so I traded in the wool for a straw cloche that my MIL had. The wool hat made its debut at preschool last week when my hair was in a state that might scare small children. Turns out the hat scared them more than the hair. Go figure. More photos from the picnic here. 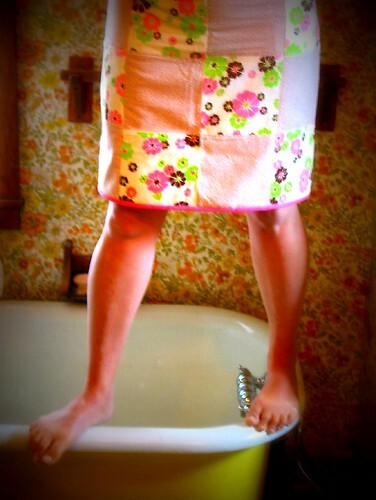 My favorite model wears a newly-made-by-me skirt from vintage fabric — a birthday present for her. These skirts work up really fast now. I can almost finish one during naptime on a good day. 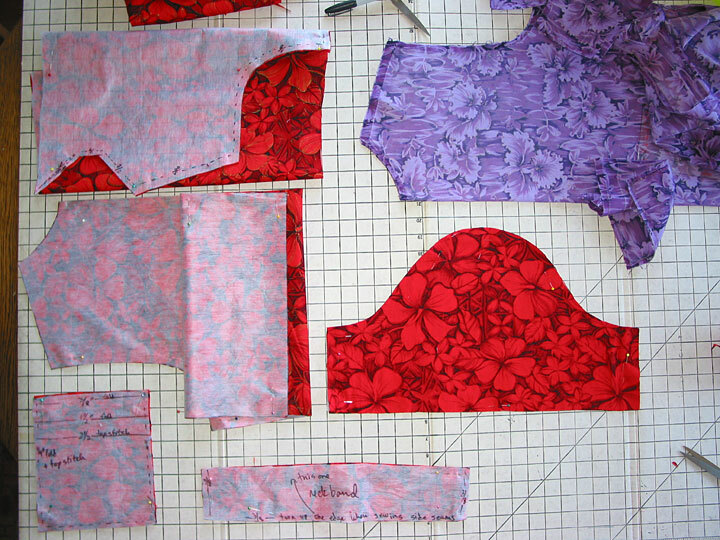 The lovely pink fabric came from the same stash as the red Hawaiian. I'm reading an old book called Pants for Any Body by this author. 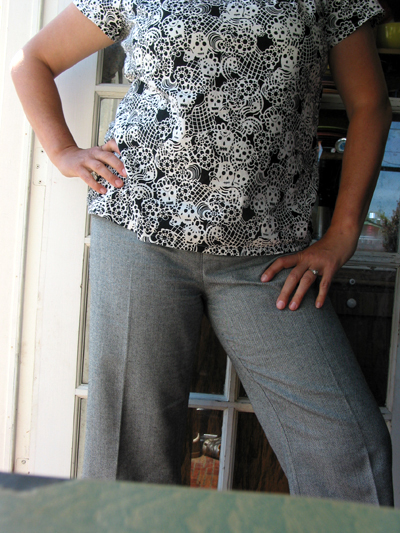 It's about altering a commercial pants pattern to fit your body. They suggest using 1/4 inch gingham as a first draft to get your exact mesurements. It's a great book so far. 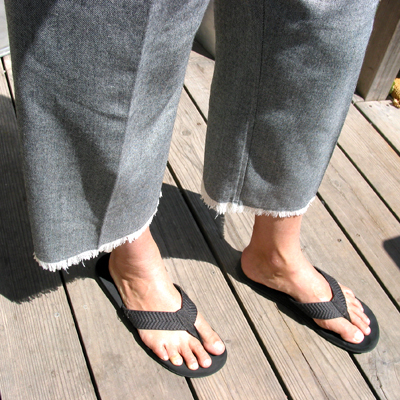 My fear of pants is waning. Aloha, my dear vintage shirt, until we meet again. I have worn and loved you till you were holey, faded, and threadbare. 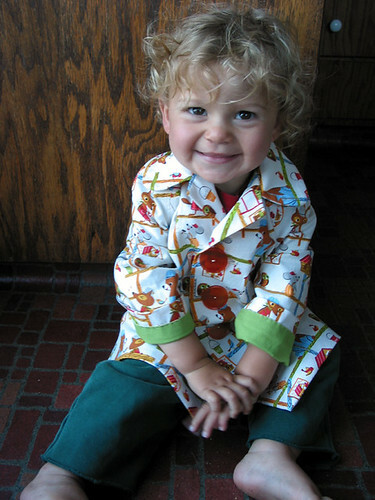 Buttons are missing and you are patched with at least five colors of thread. Thank you for being a good gardening and barbecue companion. 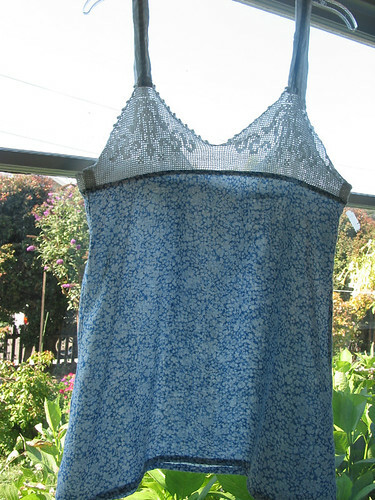 An evening date with the seam ripper taught me a lot about you. There was no consistency of seam. 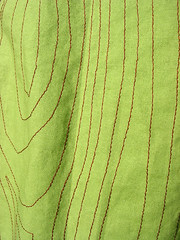 There were at least three different widths of seam. I wouldn't call you well made. Who was your maker? You looked homemade, but you had a tag that said, La Rosa San Francisco. 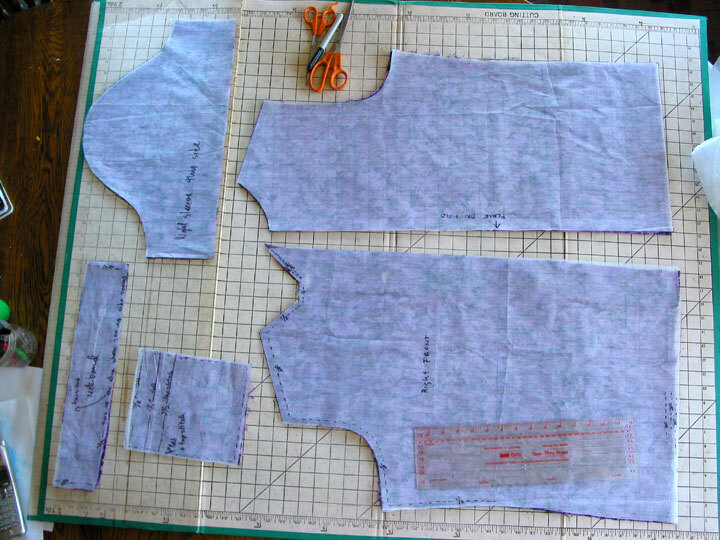 I made a pattern by tracing your pieces onto pattern paper. The grid really helped make straight lines. I wrote notes to myself on the pieces about the random seam widths. 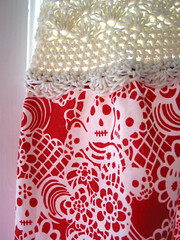 I cut out pieces from vintage red fabric that just happens to be the same brand, VHY Hawaiian. What serendipity! I didn't know about the coincidence until I started looking at your seams. 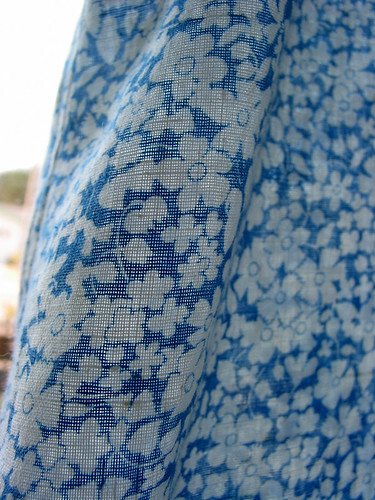 This new old fabric was a gift from Kathy who was cleaning out her 80-something mom's house. Thanks, Kathy!! Here is your replacement, your clone — that *RED* one in the front. It's not all the way finished, but is taking on more and more of your look with each detail. I will use your remaining buttons intermixed with some that I have. I can already tell that it won't be the same, not so soft and comfy, too bright. Maybe after a couple hundred washings it will feel like you. Aloha old friend. 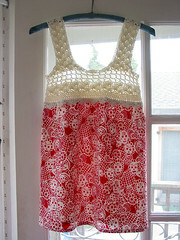 New Vintage Wardrobe & Misc. I know I should be posting a film strip style photo collection of myself as a follow up to the other two, but damn if I can't figure out some "fun idea." In addition to figuring out a theme I'd have to bathe, fix my hair, pluck hairs, match clothing, etc? That could take weeks. Not much crafting is going on at my house these days. The little guy is walking and demanding a new level of attention. Thank you to everyone who is still leaving comments. I used to reply sometimes, now it's almost never. I used to at least go visit the blogs of everyone who commented, but that's lessening, too. This two kid business is definitely busy. We survive by leaving the house, striving to have as much outdoor time as possible. I think I'm a couple years away from being back in tip top blogging shape. Until then I'll try and sneak in some crafting and posting at night and lurking to keep up with everyone. 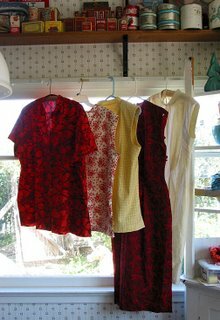 On an exciting craft note, my friend Bethany from Bitter Betty is starting a sew-a-long of sorts called New Vintage Wardrobe. 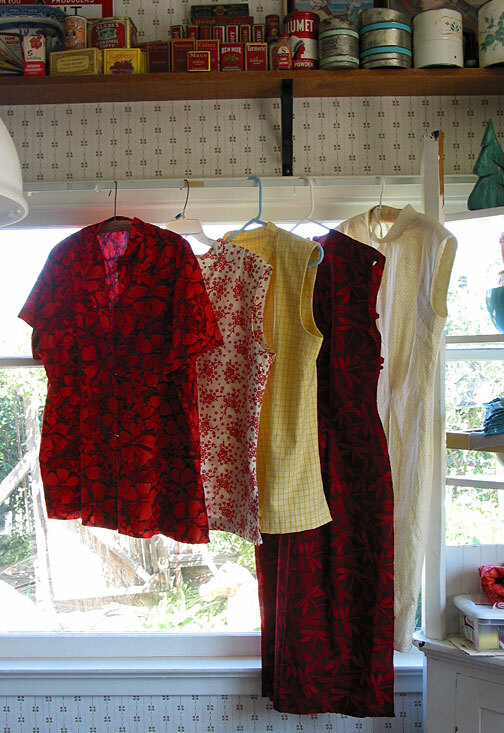 The idea is to sew contemporary clothes from vintage patterns and share the trials and tribulations with each other through blogs and the Flickr pool she started. She's already posted a couple of super cute outfits that her 11-year-old son photographed. Who knew mowing the lawn could be so fun.